Focus on the acorn harvest and the mechanization in forestry. 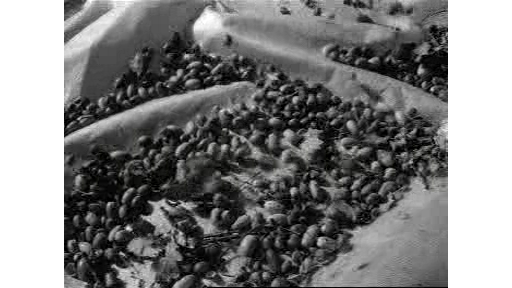 SHOTS: - (black & white) children collecting acorns alongside the road; shaking machine harvests the acorns; warehouse to store acorns; sowing acorns by machine for afforestation. - (colour) field of small oak trees; large oak; processing of blown over trees after a storm; trees are pruned and cut into pieces; machine pulls tree from the ground; tree is pulverized by a machine and processed to pulp.